Figure 8.44: The large compound eyes of Calliphora vomitoria. Note the small cells in the eye, the ommatidia. 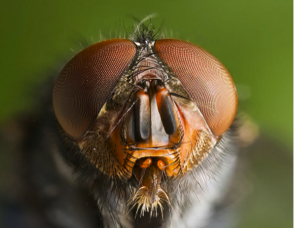 Insects have different types of organs that detect light, but perhaps the most striking is the compound eye. Compound eyes are made up of numerous small optical systems (ommatidia) arranged around the outside of a convex (shaped like the outside of a bowl) surface. There are two different types of compound eyes. In the most common type, the ommatidia are independent of each other. Each one views light to form just a small part of the overall picture that is assembled in the brain. In the other system the ommatidia pool their light together to produce one single image at the back of the eye. 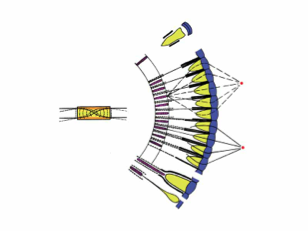 Compared to “human-type” eyes, compound eyes have a very large viewing angle because of their convex shape, have fast movement tracking because of the large number of ommatidia that do not have to individually move to track, and have the ability to detect the polarization of light. The first two characteristics allow insects to detect predators very effectively. The downside to compound eyes is that the resolution is worse- this is why astronomical telescopes have such large lenses or mirrors.